I should perhaps be clear that my previous review was not meant as an April Fools joke. Depending on your turn of mind, Christopher O’Riley’s first album of classical piano transcriptions of Radiohead songs, True Love Waits, was either brilliant or soporific. 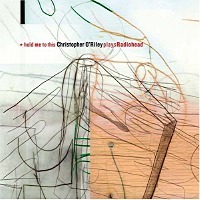 The album, featuring faithful two-hand renditions of a set of Radiohead classics, was quite a feat from a transcription standpoint, creating playable works that evoked the harmonic and rhythmic complexities of the originals. I was among the camp that found it soporific, unfortunately. After all, instrumental covers of Radiohead are nothing new—jazz piano virtuoso Brad Mehldau has been including brilliant, imaginative improvisations on “Exit Music (For a Film)” and “Everything In Its Right Place” in his sets and on recordings for years. And after a while, “True Love Waits” seems like one sameness after another. So I approached O’Riley’s follow-up, Hold Me To This, with some trepidation. The formula here is the same, but the songs are different—and that improves the product. Unlike the first recording, where all but one of the 15 tracks appeared on one of Radiohead’s albums, over a third of Hold Me To This is devoted to tracks culled from B-sides. The relative obscurity of the material seems somehow to make for better music; instead of slavish transcriptions, O’Riley adapts the material more freely, with occasionally stunning results. He also wisely eschews the studio versions of some songs in favor of transcriptions of the concert arrangements, such as “Like Spinning Plates.” The back-masking and tape loops that blurred the edges of the original song give way to an arpeggiated introduction reminiscent of the Moonlight Sonata, against which the vocal melody is set off in block chords. If there is a criticism of the arrangements themselves, it is of their busyness. O’Riley compensates for the two-handed nature of the piano by filling in missing voices with open-voiced runs and arpeggios. Too often this approach yields a harmonically accurate overload of undifferentiated hemidemisemiquavers. When O’Riley allows some space between the notes, as in “Talk Show Host,” “Sail to the Moon,” or the aforementioned “Like Spinning Plates,” the result is like drawing a deep breath. While the charge of “busyness” could just as easily be levied at Radiohead’s original arrangements, O’Riley has some options for simplification that he too rarely uses. Ultimately, “Hold Me To This” succeeds better than it deserves to as a standalone album. O’Riley’s formidable technique and intricate arrangements never quite recede far enough into the background to let the listener get totally immersed in the music, but there are pleasures to be had in appreciating formidable technique and intricate arrangements, too. Oh, and that “soporific” thing I mentioned at the beginning? It helps to turn the volume way up.